Snowsound acoustic performance takes shape in projects by great designers. Many shapes and colours are designed to be a visible and distinctive part of the project and to discreetly integrate into the spaces. Resolving acoustic problems, from the simplest to the most complex, with a complete range of products based on a totally innovative approach. Flap is a two-sided panel of a variable and lightweight surface, and can be made up of several modules, which can be located in the space according to the changing needs of contemporary lifestyles. Not so much a partition wall, but an aerial wall-mounted or ceiling mounted structure that affords the end user the utmost creative and expressive freedom. The wall-mounted Flap sound-absorbing panels can be decorated with a back-lit LED light system. The suspended Flap Ceiling frame system can be accessories with 180° directional lighting to achieve the desired illumination. The ceiling-mounted frames are in chromed steel, fitted with mobile arms, to which Flap panels are anchored with articulated hinges. The frames are modular and can be connected together in a parallel line. The panels can be rotated and inclined to make planar, concave or convex configurations, depending on aesthetic and acoustic needs. The configurations can be easily adjusted at any time. V-Flap makes it possible to achieve sound-absorbing solutions with enormous visual impact. The chromed steel frame, held in suspension by metal cables, and the two leaning sound-absorbing panels create an image of two wings that fly through space. Flap Totem is a chromed steel structure onto which are anchored six adjustable Flap panels. The base is in epoxy powder-coated steel. Flap Totem is elegant yet practical and combines the feature of acoustic correction with the distinction of being easy to move and reposition as required. Mitesco is light, colourful and sufficiently basic to be used even to personalise the surrounding area, as it can be fully inserted in a contemporary context. It can be hung and supported on a stand: it is practical and inexpensive. The Mitesco line of sound-absorbing panels has two supports that allow it to be anchored to walls or to steel supports, which keep the panel detached from the wall so as to optimise the acoustic performance. Mitesco sound-absorbing panels can be held in place by nails or screws anchored to walls with an anchor. The magnetic attachment fittings make it possible, also thanks to the lightness of the panel and to the absence of rigid or sharp-edged aluminium or PVC frames, (normally used in similar acoustic devices), to easily apply or remove panels. A solution of this type facilitates cleaning operations, both as to the panels themselves and to that of the underlying surfaces. Furthermore, with extreme simplicity, it is possible to modify the acoustics of rooms, adapting them to the user’s various needs, also allowing for varying uses for the same rooms. To further improve the flexibility of the proposed solutions and to optimise or to modify the acoustic qualities that are desired to be obtained in a given space, on occasion, the Mitesco panels can be fixed to the ceiling with coated steel modular frame or with adjustable supports, which make it possible to vary the inclination of the panels themselves and, therefore, to vary their sound absorption features with respect to the sound source and the typology of the sound. The dividers can be realised with panels placed on one side only or on two opposing sides, thus obtaining sound absorbing solutions aesthetically identical on both sides. Choosing from a range of available colours, the Mitesco panels can be freely combined with each other to obtain interesting and customised colour mixes. Mitesco panels are an excellent solution for subdividing worktops into sections, creating a visual barrier and optimising the acoustic comfort of the individual positions. Snowsound In panels, measuring 59 x 59 cm or 59 x 119 cm, can be inserted in suspended ceilings with profiles and supports that can hold their weight. The panels come with the CE mark according to the harmonised technical specification EN 13964 for use as a suspended ceiling. The Oversize system is characterised by the large size of the sound- absorbing panels made with Snowsound technology that can be located on the wall, ceiling or on a desk. 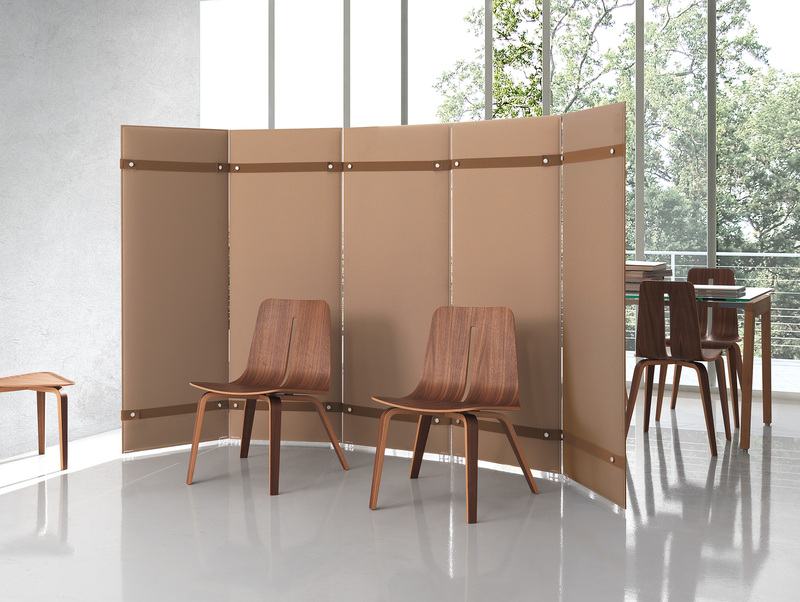 Oversize panels fixed to desks ensure more privacy of the workplace, while also allowing a separation of spaces, in accordance with a good acoustic comfort. Pli Oversize is a sound-absorbing Snowsound panel, held up by a steel frame, which can also be used as a partition to divide space. Several panels can be connected together by a strap, fitted with steel buttons and buttonholes, which wrap around the panel and create linear, “T”, “L” or “X” formations. Blade is a modular shelving system whose back panel is consisting of sound-absorbing panels made with Snowsound technology. The slim shelves create a visually light and minimalist overall image. The shelves are entirely made in epoxy powder-coated steel: a wall- mounted load-bearing core and a very thin external lining (support surface). Pli is a sound-absorbing partition wall, made up of Snowsound panels joined with elastic bands available in three finishes. The bands embrace the panel and are furnished with steel buttons and O-rings that create linear “T”, “L” or “X” configurations. Pli offers a large variety of colours for the panels and the fabric bands, to mix and match. The Pli system can be furnished with a chromed steel supporting base. Pli sound-absorbing panels can be also used as desk top partitions, thereby ensuring acoustic comfort, privacy and ultimate freedom of configuration thanks to the elastic straps that hold the panels together to create linear, “T”, “L” or “X” formations. Corner system, which uses Snowsound technology panels, is an ideal way to divide up work surfaces by creating a visual barrier while also optimising acoustic comfort. A compact size, together with a robust construction, are the strengths of the mounting hardware that make it possible to apply Snowsound panels to the desk using clamps or directly to the desk with screws. Snowfront system, which uses panels made with Snowsound technology, is an ideal way to divide up work surfaces by creating a visual barrier while also optimising acoustic comfort. Snowfront allows the panels to be positioned on the work surface using metal clamps at the desired height. A name and a function: a cascade of ceiling panels suspended from fine cables, magically anchored to the tops of the panels. Baffle creates a powerful sound-absorbing barrier in an outwardly random, delightful architecture. The design is reminiscent of the classic image of laundry hanging on lines between Italian houses. Baffle is a patented system designed to hang Snowsound sound-absorbing panels from the ceiling, showcasing its lightness and elegance. The adjustable height of the cables and the array of sizes and colours available make it possible to achieve compositions that can be personalised for aesthetics and sound. The patented joining system of the panel to the cables is completely invisible: a small cylindrical joint hides the anchoring system inside. The Baffle anchors can be positioned along the upper edge of the panel, without particular limitations of space between the cables, in order to simplify ceiling installation. Two parallel cables make up the structural track in a composition of panels that creates an effective sound absorbing system, one element in improving the sound quality of the space. The ability to freely locate the panels along the cables makes it possible to construct dramatic backdrops. Tra is a patented system consisting of Snowsound sound-absorbing panels suspended to a pair of stainless steel cables which are connected between two walls while maintaining a natural curve. The supporting cables can be positioned at a number of angles. Snowsound panels can be hung by cables in multiple positions, thereby creating compositions that can be personalised for aesthetics and sound. Corista is a product for sound modulation, initially designed for a specialised user group: recording and mixing studios, home recording, theatres or venues where musical performances can be improvised. It was later discovered that it could also be located beautifully in other areas – meeting rooms, home theatre, conference and seminar rooms. Constructed in powder-coated steel, the easel is not only a practical support for the panel, it can also double as a convenient handle for transport. The easels can be set side by side, maximising the space available when the panels are not in use. Diesis and Bemolle are sound-absorbing elements with steel base and drapes based on Snowsound-Fiber technology. These pieces feature steel frames at the top that create the sound-absorbing drape, thus assuming precise rays and layers, designed to optimise acoustic performance. Diesis is available in both ceiling mounted or freestanding versions. Bemolle is designed for wall-mounting. Its “U” curves create three layers of fabric designed specifically for optimal performance. Sipario sound-absorbing system is made of modular panels with steel frame and washable, removable covering, made with Snowsound-Fiber technology applied with Velcro to the structure. The structure is anchored to the wall by chromed metal clamps equipped with special springs that give the structure elasticity while also making it possible to adjust the distance from the wall and the tilt of the panels, to regulate the sound-absorption level of every configuration, adapting it to a variety of needs. The composition of the panels creates a diversity of configurations, allowing the designer ample freedom of interpretation. Palio sound-absorbing system is consisting of removable, washable panels, made with Snowsound-Fiber technology, and a metal frame. Chromed metal clamps are equipped with special clamps that give the structure elasticity while also making it possible to adjust the distance from the wall and the overlapping of the panels, to regulate the sound-absorption level of every configuration, adapting it to a variety of needs. Cocker is a comfortable phone booth composed by an internal padding in sound-absorbing polyester foam covered in Trevira CS® polyester which is completely removable. It also features an independent load-bearing frame in tubular chromed steel. The soft, moveable sides have been specifically designed to move freely if accidentally bumped. Snowall is made up of polyester felt paired with a polyester Trevira CS® material using a unique application system. The felt lining and the absence of space between the two materials significantly reduces its propensity to attract dust, pollen and insects. Snowall has Euroclass B-s2, d0 classification as to reaction to fire. © 2017 Ergoworld Pte Ltd.